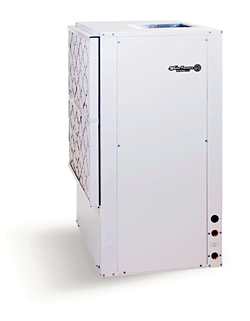 Versatec Ultra water source heat pump for water loop and geothermal applications has a 17.2 EER and a 3.5 coeffient of performance. Available in capacities from 9,000 to 70,000 Btuh output. Features single capacity rotary or scroll compressors that are paired with PSC blower motors.